I couldn't help but share this recipe, folks. I whipped these up the other night to make chicken tacos and they were DI.VINE. It was insane how good these were. And the effort it took to make them? So minimal it's not even worth mentioning. I've always been one to prefer soft tacos over hard, but I've never considered myself a tortilla snob. I'll just take what I can get -- whether it's what the restaurant serves or what the store stocks on their shelves. And really, the only time I'd use tortillas would be for tacos. I've never tried them as wraps or anything crazy like that. But let me tell you, these tortillas are SO MUCH BETTER than ANYTHING you can find in the store, and I'd say they are even better than what is served in your typical restaurant. 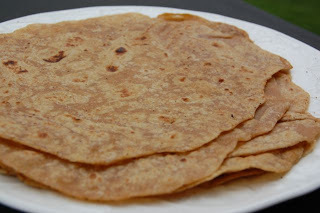 When I made them the other night, I cut the recipe in half to make only 6 tortillas (knowing LO wouldn't touch one and hubs isn't the biggest fan). Plus I wasn't sure if I would have success with the recipe or admit defeat to yet another failure of homemade cooking (it's not as easy as you think!). After I tasted the first one I made, I immediately wished I had made the full recipe for 12 tortillas. They were THAT good. The best part? And if you know us well, you'll know this is a HUGE accomplishment... I was able to get LO to eat one! She wasn't a big fan of the chicken and cheese "roll-up" I made for her that night, but when I put her trusty peanut butter and jelly into a "roll-up" and served it for lunch the next day, she scarfed it down with only slight pleading on my part! I was amazed! LO just doesn't eat (or like) anything new! Yay! I also ate some for leftovers the next day, and hubs sounded somewhat disappointed when I told him that yes, the tortillas were all gone. :( These are definitely a keeper, and I will be making these often for our family. Give the recipe a try -- you won't regret it! Click here for the recipe from The Food Illusion -- one of my newest favorite blogs! I bookmarked this when you first posted it and have been wanting to make them ever since. I finally made them tonight - in a word, AMAZING!!! So so so so yummy! I had to cut the oil down to 1/4c (the batch made with 1/2c. was so gross I literally had to throw it away before even rolling it out), but otherwise so so yummy! Thank you!! !